Without a doubt, there are experiences in life that prove to be unforgettable and swimming with dolphins in the Riviera Maya is definitely one of them. In addition to the happiness, learning and entertainment that this activity provides, there are other benefits that are important to highlight. Experts confirm that swimming with these animals allows people to experience powerful emotions associated with the connection with nature, even making us feel like a part of nature. This is how the interest to get to know and admire the complex marine ecosystem and each one of its components arises. In addition to the benefits that the aquatic environment provides, the positive impact of this activity is also based on the affinity that exists between dolphins and human beings, as well as on the natural characteristics we share with them, for example: organization in social groups, parental care and altruistic behaviors. Scientific evidence suggests that the different ways in which recreational activities can be conducted with animals (in museums, zoos, aquariums, etc.) enable the public to take ownership of the knowledge or information about such components of nature, but also generate an impact on attitudes, commitments and possibilities to participate in projects for the conservation and care of the environment. 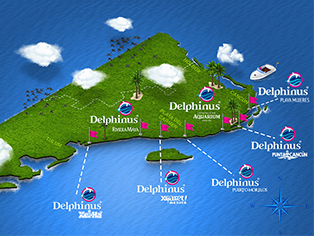 At Delphinus, we want your experience of swimming with dolphins in the Riviera Maya to be the very best. We invite you to visit our facilities and live a truly magical and beneficial moment.